Melior Via is participating in the Charity Bundle assembled by Roleplayers Chronicle to provide a donation to the American Red Cross, earmarked for the victims of Hurricane Sandy. The Charity Bundle is now available on DriveThruRPG for a donation of $20. Many publishers have contributed products, and this bundle is now valued at more than $200. 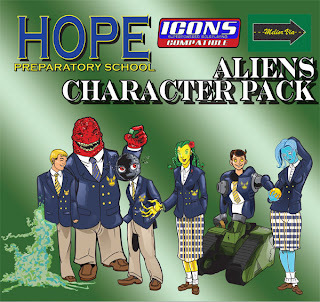 Our contribution is the Hope Preparatory School Freshman Handbook for ICONS. All proceeds from this charity bundle go towards the American Red Cross and the relief efforts for the victims of Hurricane Sandy. None of the contributors towards the bundle receive any compensation for their products. This bundle will be available for 10 days starting November 1, 2012 and ending November 10, 2012. Halloween is coming quickly. 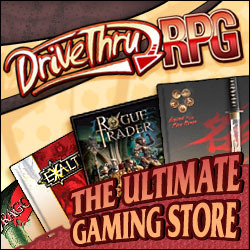 If anyone is looking for an appropriately themed scenario, we've launched a brief sale on DriveThruRPG. Our Halloween Ball adventure is currently priced at $3.99 (regularly $4.99). The adventure takes place during the days leading up to the big party, as the PCs must confront some of the mischief that goes hand in hand with the event. For those looking for a 1-shot night, that haven't tried out the Hope Prep setting, we've also put together a bundle that includes the Freshman Handbook, Halloween Ball, and Freshman Character Pack. That (along with the core rules for the system) should be everything needed for a quick holiday adventure at HPS. 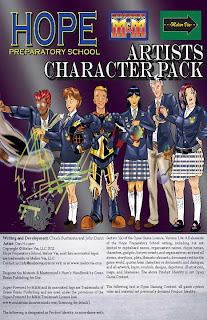 We've just released the Hope Preparatory School Artists character pack for ICONS from Ad Infinitum Adventures. The core content is the same as the M&M3 version which we released a few weeks ago, but the characters are slightly changed so that they better reflect this game system. Just like the previous release, the The HPS Artists Character Pack includes six fully statted members of the Artist clique for the Hope Preparatory School setting. The pack includes two Sophomores, two Juniors, and two Seniors. The next adventure -- Field Trip -- is just waiting for one last piece of artwork, so that we can get it out the door and up for sale. This week, we managed to squeeze out another small release for the M&M version of the Hope Preparatory School Setting. This is the Artists Character Pack, now available from DriveThruRPG for $2.99. It features the artwork of Dan Houser. Members of the Artists Clique aren't necessarily focused on becoming traditional crime fighting vigilantes. Instead, these metahumans often want to do more with their abilities. Some, believe they may be able to serve humanity as scientists, politicians, or philosophers. Others pursue dreams of a career as a professional athlete or a performer. The character pack includes two Sophomores (PL8), two Juniors (PL9), and two Seniors (PL10), each from that clique. All are fully statted for use as PCs or NPCs in a M&M3 campaign. In adventures run at HPS, they might serve as friends or foils. In a more traditional setting, the characters could easily be friends, supporters, or even interns. The ICONS version of the character pack is next up in the queue, and shouldn't be too far off. So, I looked into buying a nice felt map that was big enough to cover my table, and discovered that they were, well, kind of expensive. Kind of prohibitively expensive for my purposes. That led to me poking around the web for a cheaper solution. I found something that would work well enough for the short term, but I wanted something better. So, I decided to go ahead and spend the time to design my own map. The Universal Space Combat Battlemap was the result. I designed the PDF so that it could be printed with 1-inch hexes, 1.5-inch hexes, or 2-inch squares. 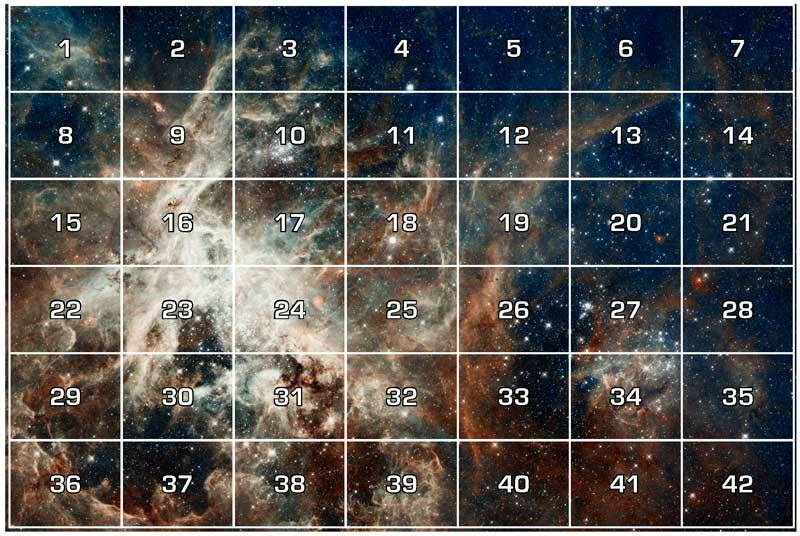 For games that don't use a grid, it can also be printed blank. I grabbed a nice looking picture of the Tarantula Nebula, and used that as a background. Yes, it takes 42 pages to print it. There's a fair bit of a cutting and glue-sticking involved in the procedure. But, in the end, I'm pretty happy with how it turned out. Here's a quick look-see at how the pages fit together. 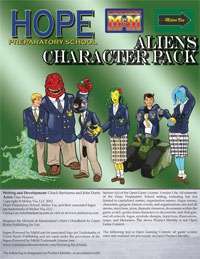 The version of the Hope Preparatory School Aliens Character Pack for M&M3E has just gone up for sale on DriveThruRPG. Pricing for this version is the same as the ICONS version, at $2.99 a copy. In other news, though, HPS #3 - Field Trip is currently in editing. I'm hoping it won't be too terribly long before we can have that up for sale too. Thanks for the support, and good gaming! I'm afraid I've been pretty busy with freelance assignments and have woefully neglected this site for entirely too long. I'm currently trying to catch up on Melior Via projects, most notably work on the Hope Prep setting. The first fruit of those labors is now available for sale. The Aliens Character Pack for ICONS is now available. This introduces 6 new characters, who are all members of the Aliens clique. Two are sophomores, two juniors, and two seniors. Each includes artwork from Dan Houser. The M&M3 version of this should be available in the next week or two.